A significant earthquake in the Wellington region will result in damage to the potable water network, and could result in parts of the region being without water for long periods. To overcome this, Wellington Water Ltd (WWL) initiated the Community Infrastructure Resilience (CIR) project. The goal of this project is to provide 20L per person per day of potable water within 1,000m of their residence, for a total of approximately 400,000 people in the Wellington region. The emergency water network includes 22 community water stations. The water station can be deployed to areas of highest need after the earthquake and used to extract surface water. Utilising existing reservoirs, including bores, rivers and streams to extract water it will pass through a community water station where it is treated and made safe. At these on-site reservoirs water will then be stored in 20,000 litre bladders. Smaller transportable bladders will then used to transfer to the community collection points. These specially designed transportable bladders that can be used on utes, trailers and vans for safe transportation and partial off-loading on route. Water collection points using flexible 5,000 litre drums will then be set-up in locations like schools, parks and roadsides to enable accessible water collection from every home. The solution provides significant value-for-money and will achieve the goal of providing access to emergency water within 1,000m of every dwelling at a fraction of the ‘dig and lay pipe’ alternative. 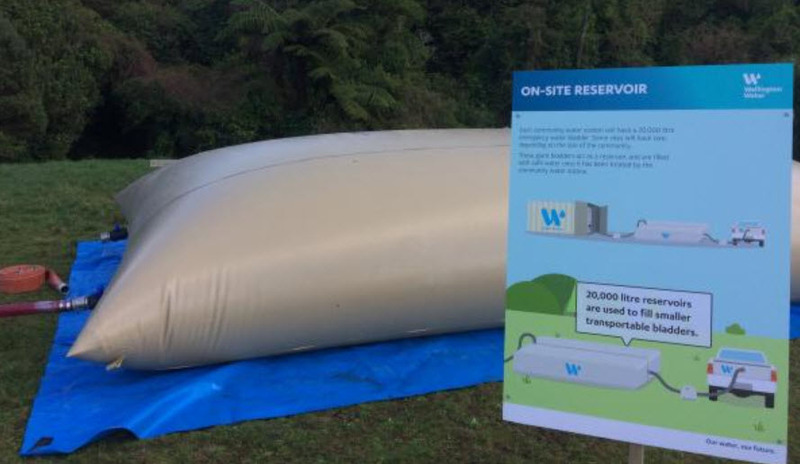 By installing the 22 water stations and developing a temporary distribution network, the Wellington region has created a resilient water supply network that is well prepared for the next significant earthquake. Wellington’s drinking water network is vulnerable, with some suburbs without water for more than 100 days after a major earthquake. The above ground water sources won’t be the only supply of emergency water. Water within existing reservoirs and the time of the earthquake can also be used, this includes bores, rivers and streams.